After the failure of the citrus ranch when Nixon was nine years old, his family moved to Whittier, a predominantely Quaker community named after Quaker poet John Greenleaf Whittier. In Whittier, Nixon's parents opened what became a successful gas station and general store operation.Young Nixon was an avid reader who often withdrew from the company of other children to read a book. An excellent student at local public schools, he enjoyed English literature, history, and Latin. As an adult he could recite passages from Virgil and Cicero that he had learned in childhood. In RN Nixon says that he had to turn down scholarships to Harvard and Yale because his family could not afford the cost of travel to the East Coast. Instead he stayed at home and attended the Quaker-affiliated Whittier College. At Whittier, an English professor encouraged him to read the works of Tolstoy. Nixon recalls that his favorite of Tolstoy's novels was Resurection but "I was even more deeply affected by the philosophical works of his later years. His program for a peaceful revolution for the downtrodden Russian masses, his passionate opposition to war, and his emphasis on the spiritual elements in all aspects of life left a more lasting impression on me than his novels. At that time in my life I became a Tolstoyan." Also during his college years Nixon received a copy of a biography of Gandhi from his grandmother. In RN, Nixon writes that he read the Gandhi book "from cover to cover" and that "Gandhi's concept of peaceful change and passive resistance appealed to [his grandmother], and she had a deep Quaker opposition to any racial or religious prejudice." Like many politicians, Nixon often exaggerated the humbleness of his origins. His mother's family, the Milhouses, were among the most prominent and affluent families in the Whittier area. One of Nixon's many Milhous relatives living nearby when he was growing up was his cousin Jessamyn West. A decade older than Nixon, after graduating from Whittier College and doing graduate work at Oxford University, West went on to a successful career as a fiction writer, including numerous stories published in The New Yorker, the Atlantic Monthly, and other top literary publications. West's most notable work is The Friendly Persuasion, a 1945 collection of stories about Quakers on the nineteenth-century Indiana frontier. The characters in the stories were based on the Milhous forebears she shared with Nixon, including their great-grandfather, Joshua Milhous. 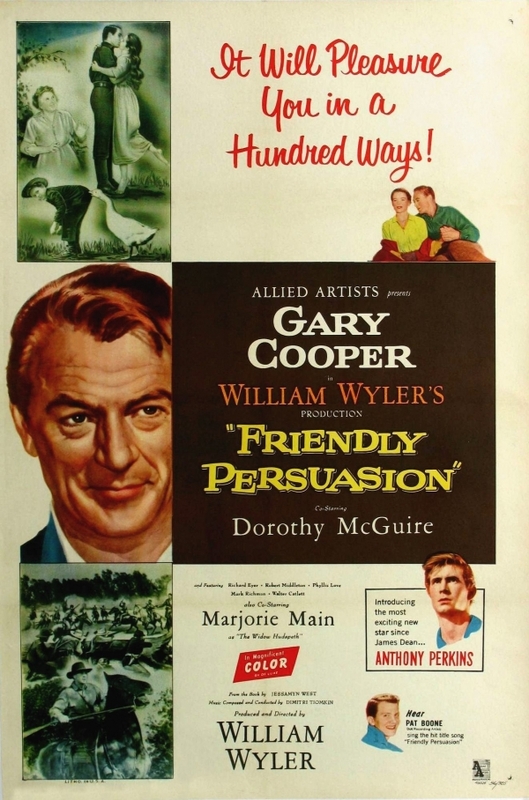 In 1956, The Friendly Persuasion was made into a popular and highly regarded film, Friendly Persuasion (dropping "The") starring Gary Cooper as a character based on Joshua Milhous. Although he wrote ten books over the course of his lifetime, Nixon struggled with putting his thoughts down on paper. He much preferred thrashing out issues in a debate forum where his exceptional ability to retain information came into play. It was only after losing to John F. Kennedy in the 1960 presidential election, when it seemed possible that his political career was over, that former Vice-President Nixon reluctantly turned his attention to writing a book. According to biographer Stephen Ambrose in Nixon: The Education of a Politician, at the urging of many of his supporters, especially the journalist Adela Rogers St. John, in the spring of 1961 Nixon contracted with the publisher Doubleday and Company to write a memoir. Titled Six Crises, the memoir was built around the critical moments in Nixon's fifteen years of public life -- his involvement in the Alger Hiss case concerning the alleged infiltration of U.S. State Department by Communists in 1948; his almost being dropped as Eisenhower's running mate in the 1952 Republican presidential ticket due to accusations of misuse of political funds; his serving as "acting president" while Eisenhower recovered from a heart attack in 1955; he and his wife Pat being stoned by an angry mob during a trip to Venezuela in 1958; his "kitchen debate" with Soviet leader Nikita Khrushchev in 1959; his losing the presidential race in 1960. Nixon wrote rough drafts on legal pads then dictated what he had written into a recording machine. His long time secretary Rose Mary Woods typed up his notes. Journalists Alvin Moscow, Stephen Hess, and Earl Mazo helped put the book together but the main author was Nixon. In September 1961, Nixon announced his candidacy for governor of California, rejecting the opinions of his advisers who said he was out of touch with California politics and that he would not have the full support of the state's Republican Party. Nixon, his assistants, and Doubleday worked quickly to get the memoir finished and released by the spring of 1962 when the gubernatorial campaign would go into full swing. In the introduction to the first edition of Six Crises, Nixon says the writing of the book "turned out to be the seventh major crisis of my life, and by far the most difficult from the standpoint of the mental discipline involved. My respect for those who write books, already high, has gone up a hundredfold." Biographer Ambrose calls Six Crises "as complex as the author himself...It reminded voters that [Nixon] had been Vice-President for eight years, that he had vast experience in government, and that he could be a good loser...He told some fibs, was guilty of some exaggerations, but overall wrote an accurate, if partisan and one-sided, record of the events he described." Nixon biographer Fawn Brodie in Richard Nixon: The Shaping of His Character writes -- "Six Crises helped restore Nixon's self-image and political identity. He told his readers he would have made a better president than Kennedy, that he would have supplied air cover to the Cuban guerrillas at the Bay of Pigs, and would if necessary have sent in American forces to destroy the infamous Castro.Over and again he underlined his preoccupation not only with becoming president but also with being a great man." Soon after its release in April 1962, Six Crises entered the top ten on the New York Times non-fiction bestsellers list and stayed there for two months, going as high as number four in May 1962. Other titles in the non-fiction top ten were The Guns of August, an examination of the causes of World War I, by Barbara Tuchman, My Life in Court, leading trial lawyer Louis Nizer's recounting of his notable cases, and Calories Don't Count, a diet book advocating the use of vegetable oil supplements as a way to lose weight, by Dr. Herman Taller, who, according to the New York Times, was later convicted of fraud and conspiracy for using the book to sell a certain brand of safflower oil capsule. 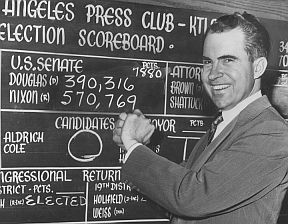 As many predicted, Nixon managed to win the 1962 Republican nomination for governor but lost the general election to Democratic incumbent Edmund G. "Pat" Brown, Sr. The campaign ended with an angry and frustrated Nixon holding a press conference at which he informed reporters that "you won't have Nixon to kick around anymore, because, gentlemen, this is my last press conference." Though the 1962 campaign was a disaster, Six Crises was a great success that Nixon took pride in for the rest of his life. Ambrose writes -- "Six Crises took on a life of its own, until Nixon began referring to it almost in the third person, as if he had nothing to do with its creation. During Watergate, he would constantly urge his aides to read Six Crises for inspiration and insight." After resigning from the Presidency in August 1974 under threat of impeachment for his involvement in the Watergate scandal, Nixon found himself deep in debt due to legal fees and back taxes. In the fall of 1974, as Nixon lay hospitalized with life-threatening blood clots, Hollywood agent Irving "Swifty" Lazar shopped around the rights to Nixon's autobiography. Controversy surrounding Nixon's resignation and pardon by President Gerald Ford caused major publishers to turn down the offer. Finally, Nixon signed with Warner Paperback Library for a $2.5 million advance. The deal raised a storm of protest from members of the media and the public who objected to Nixon profiting from his disgraced presidency especially while many of his non-pardoned underlings were facing prosecution and possible jail time. Living in relative seclusion at this home in San Clemente, California Nixon worked on his memoirs over the next three years. Wearing a suit and tie, he would arrive at his office on the San Clemente compound early in the morning ready to work. 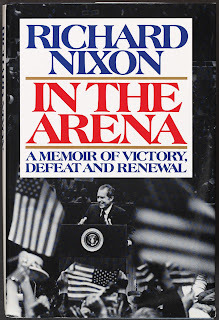 According to Jonathan Aitken in Nixon: A Life, Nixon's attitude towards what would go into the book was "We won't grovel; we won't confess; we won't do a mea culpa act; but we will be one hundred percent accurate." Nixon was aided in the project by a small number of staffers he had brought with him from the White House, including the young Diane Sawyer, who would go on to a successful career as a television journalist. In 2010, Sawyer told Parade Magazine that she went to San Clemente out of "a sense of duty. I felt you don’t get to choose just being there in the celebrated times and then get to walk away when someone is living in defeat." Nixon's desire to use the memoir to tell his side of the story strengthened after the release of The Final Days, Bob Woodward and Carl Bernstein's 1976 book about the last days of the Nixon administration that describes a deranged Nixon talking to portraits on the White House walls and heavy drinking by both Nixon and his wife. Nixon was so infuriated by The Final Days he considered suing Woodward and Bernstein. He also believed that his wife's reading of The Final Days helped bring on the stroke she suffered in 1976. RN: The Memoirs of Richard Nixon was released in May 1978. The initials are meant to liken Nixon to Theodore Roosevelt, often called TR, who Nixon referenced in his final speech to the nation as president. About one-third of the 1,100 page book is devoted to Watergate. In the introduction to the 1990 Nixon Library edition of RN, Nixon writes "if I had not taken the subject on in as much detail, the critics would have been even more vicious. Also, the process of living through Watergate again, virtually day by day, as I sorted through the details of those events permitted me to put them behind me once and for all." The release of RN renewed charges of profiteering. Some stores refused to sell the book. A Washington, DC based group called the Committee to Boycott Nixon's Memoirs created merchandise including bumper stickers and t-shirts with the slogan "Don't Buy Books from Crooks." According to Craig Fehrman in the New York Times the anti-RN group gained considerable media attention including an appearance by the group's leader on national television, favorable words from syndicated columnist Mary McGrory, and Dan Ackroyd waving around one of their t-shirts on television's Saturday Night Live. Despite the protest, RN reached number two on the New York Times list of bestselling non-fiction. According to Ranker.com RN is number fifty-six on the Publisher's Weekly list of top-selling non-fiction of the 1970s, well above Woodward and Bernstein's The Final Days at number seventy-two. The success of RN was a major part of Nixon's comeback as a public figure. In 1980, he moved from San Clemente, which he found isolated and too far away from the centers of power, to Manhattan. He later lived the New Jersey suburbs of New York. Nixon went on to write eight other books -- The Real War (1980), a blueprint for ending the Cold War; Leaders (1982), biographical profiles of world leaders with whom he interacted during his political career including Leonid Brezhnev and Golda Meir; Real Peace (1983), which advocates peace through detente and improved East-West economic ties; No More Vietnams (1985), which calls for the U.S. to take a new approach towards developing nations; 1999: Victory without War (1988), which asserts that conflict between nations is inevitable; In the Arena (1990), a memoir which offers more details about his early life and political career; Seize the Moment: America's Challenge in a One-Superpower World (1992), about the challenges facing the U.S. after the collapse of the Soviet Union; and Beyond Peace (1994), a posthumously published outline for U.S. foreign and domestic policy in the twenty-first century. Elizabeth Drew in Richard M. Nixon, a volume in The American Presidents Series edited by Arthur M. Schlesinger, Jr., calls the Nixon-penned books "mostly turgid and not very revealing, and though there were interesting passages, he shaped the past as it suited him. There's no clear evidence that his writings had a substantive impact on policy, but aside from producing income, they were part of Nixon's elaborate effort to merchandise himself as a sage." Presidential historian Robert Dallek writing in the Los Angeles Times says -- "No politician in American history had a longer and more controversial career than Richard Nixon. His actions during his forty-eight years as a congressman, senator, vice president, gubernatorial candidate, president, writer and world statesman provoked uncommonly strong expressions of support and opposition...Nixon's nine post-presidential books, ranging from his memoirs, RN, published in 1978, to his discussions of political leadership, Vietnam and American foreign policy in a Cold War and post-Cold War world, will become documents in the search for understanding [of Nixon]." In April 1994, Nixon suffered a stroke while at home in New Jersey working on his final book Beyond Peace. He died a few days later at a hospital in Manhattan at age eighty-one. Nixon Presidential Library and Museum, Yorba Linda, California. Interview with Jessamyn West, The Art of Fiction, no.67. The Paris Review, Fall 1977. This is a fascinating portrait of Nixon as a reader and writer. It is both well-researched and well-balanced. It also helps me to understand the respect many people seemed to have for the man--in spite of Watergate--at the time of his death. I look forward to reading other entries in this presidential series. I am unsure concerning the sources, however i and know bond, and you'll discover a guidance how you can enhance your blog, if you choose to make your own and share illnesses there. So, custom writing service in US you'll find all you want. Very good post. I simply came across your blog and wanted to state that I've really enjoyed reading your blog posts. In whatever way I'm going to be subscribing to your feed and I hope you post again soon.